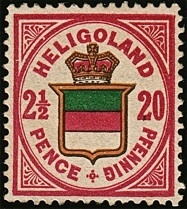 The main purpose of this web site is to celebrate the beauty of Heligoland Philately. where I can share my Collection and Internet Findings with others. by providing visuals and examples of the stamps and cancellations listed. but time constraints and other excuses have prevented that. So it’s a work in progress. Please bear with me as I add more content over the months to come. Thank You for visiting and I hope you will enjoy the web site.